The five continental team championships to be held this month will determine qualifying places for the TOTAL BWF Thomas & Uber Cup Finals 2018. Four places from Asia and Europe, and one each from Oceania, Pan Am and Africa, will be up for grabs at the respective continental championships. 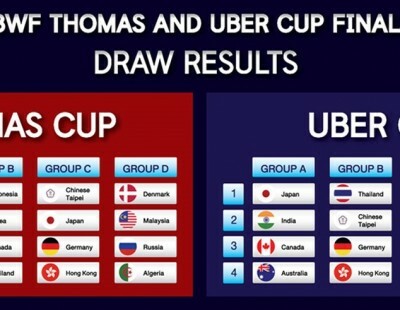 The Thomas & Uber Cup Finals are being held 20-27 May in Bangkok, Thailand. The World Men’s Team Championships (Thomas Cup) and the World Women’s Team Championships (Uber Cup) will be fought between sixteen teams each. The hosts and the defending champions are each reserved one place. The semi-finalists at the E-Plus Badminton Asia Team Championships and the 2018 European Men’s & Women’s Team Championships will decide the four qualifiers from Asia and Europe respectively. The winners of the continental championships of Oceania, Pan Am and Africa will also make it to Bangkok. The last three places will go to the teams that are next highest in World ranking. If the trophy holders (Denmark – featured image – and China respectively) and/or hosts (Thailand) take part in the continental championships and occupy a qualifying position, the next one or two highest ranked teams from the World rankings in the same continent will also qualify. The World rankings of 22 February 2018 will be used to determine the qualifiers. Teams have to confirm their participation by 15 March; the date for the draw has been set for 23 March 2018 in Bangkok.